A Nest Full of Squishers: Santa was a Bust! 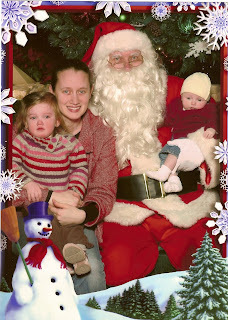 My mom and I took the girls to see Santa today. Little Bo Peep was fine until my mom was about to put her on Santa's lap. Then the waterworks started! Santa reassured me that we all have pictures like this one around the house. Thanks Santa!